Older than the state of Colorado itself, The Cliff House was a stagecoach stop before becoming a favorite of the glamour set. Luminaries of the early part of the century like Ferdinand, Crown Prince of Austria and J. Paul Getty enjoyed concerts on the lawn and sipping water straight from the mineral springs across the street. Guest room décor recalls the late 1800s – armoires, teals, and celadons. Naturally, the spa tubs and steam showers are state-of-the-art. Celebrity Suites are named for famous guests of the past, but be careful who you ask for: the Jenny Lind Suite has peach walls, green valences and dark wood tables with spindly legs, while the Buffalo Bill Suite looks like the inside of a tent on the High Plains. Drink in the Rocky Mountain air from the Veranda, which gets late afternoon sun and has the best seats in the house for watching the sunset over Pikes Peak. The Cliff House Dining Room is an AAA Four-Diamond restaurant informed by the food culture of the West. Half the dishes on the list could have been brought to the kitchen by a local hunter: Duck Crepes, Grilled Quail, Bison Sirloin. The wine cellar has more than 700 selections. 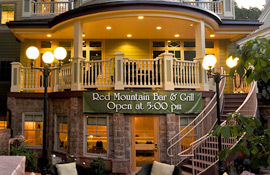 Red Mountain Bar and Grill offers pub fare in a relaxed environment: brown-leather couches, a fire pit. Dine outdoors (weather permitting) on The Veranda. The Cliff House saw the Gold Rush, gave shelter to trappers and hunters, bathed wealthy 19th-century capitalists in healing mineral water, and survived flood and fire before re-emerging in its present luxurious incarnation. In Manitou Springs, a 15-minute drive from Colorado Springs towards the Pike National Forest. No penalty if reservation is cancelled by 3pm, 1 day prior to arrival. The Cliff House at Pikes Peak combines the 19th century charm and atmosphere of the Rocky Mountains with the high-tech digital demands of 21st century business. With a variety of meeting rooms available, meeting planners, event organizers and incentive buyers will find an ideal space to hold their next event. The technology available at the Cliff House is as modern as any hotel in America, allowing guests to function as efficiently as if they were in the comfort of their own home or office.